This page will walk through Angular 2 custom directives example. Angular provides three types of directive: component directive, attribute directive and structural directive. Component directive is used to create HTML template. Attribute directive changes the appearance and behavior of DOM element. Structural directive changes the DOM layout by adding and removing DOM elements. On this page we will provide how to create custom attribute and structural directives. In angular we create these directives using @Directive() decorator. It has a selector metadata that defines the custom directive name. Angular also provides built-in directives. The built-in attribute directives are NgStyle, NgClass etc. These directives change the appearance and behavior of HTML elements. The built-in structural directives are NgFor and NgIf etc. These directives can add and remove HTML elements from the DOM layout. Custom directives are created using following syntax. The directive name is cpDir here. It should be enclosed within bracket . We can keep directive name as we want but it should be started with your company name or any other keyword but not with Angular keyword such as ng. To behave our directive like attribute directive, we can use ElementRef to change appearance. To listen event we can use @HostListener() decorator. To behave our directive like structural directive, we can use TemplateRef and ViewContainerRef. Now find the complete custom attribute directive and custom structural directive example step by step. Angular custom attribute is created to change appearance and behavior of HTML element. Find the steps to create custom attribute directive. 1. Create a class decorated with @Directive(). 2. Assign the attribute directive name using selector metadata of @Directive() decorator enclosed with bracket  . 3. Use ElementRef class to access DOM to change host element appearance. 4. Use @Input() decorator to accept user input in our custom directive. 5. Use @HostListener() decorator to listen events in custom attribute directive. 6. Configure custom attribute directive class in application module in the declarations metadata of @NgModule decorator. To change appearance of HTML element in DOM, we need to use ElementRef within custom directive definition. ElementRef can directly access the DOM. We can use it directly without using directive but that can lead to XSS attacks. It is safer to use ElementRef within directive definition. Now let us create custom attribute directives. We are creating a simple attribute directive that will change color and font size of a HTML element. AfterViewInit is the lifecycle hook that is called after a component view has been fully initialized. To use AfterViewInit, our class will implement it and override its method ngAfterViewInit(). Directives are declared in application module in the same way as we declare component. We need to configure our each and every directive in application module within the declarations block of @NgModule decorator. Now we are ready to use our custom directive in our application in any component template. The text of the <p> element will be blue with font size 20px. Angular custom directive can also accept input from the user. To accept input within directive we need to declare a property decorated with @Input(). We must use property name same as selector name. If we want to use different property name from selector name then use alias with @Input(). Now alias name will be same as selector name. We will create a custom directive that will accept input from the user. Here for the example we will accept color as a user input. Look into the above code, selector name and property name are the same. If we want to use alias we can use as follows. The text of <h4> will be shown in the user provided color. If we want to accept more than one input then create more than one properties decorated with @Input(). User is providing color and font size as an input. The text of <div> tag will be shown with the given color and font size. If we want to change element appearance in DOM on any event then we need to listen event in our custom directive. To listen event we will use Angular @HostListener() decorator in our custom directive. The event name will be assigned to @HostListener() decorator. Here we are creating a custom attribute directive using @HostListener() decorator. The color of text of <p> tag will change on mouse event. On mouse over event , color of text will be red and on mouse leave event, the color of text will be black. We can also use @HostListener() with @Input() to get user input. On mouse over, the background color will be user provided color and on mouse leave the background color will be white. If we don't accept the user input color then on mouse over, blue background color as default will be shown. Structural directive is used to change the DOM layout by adding and removing DOM elements. 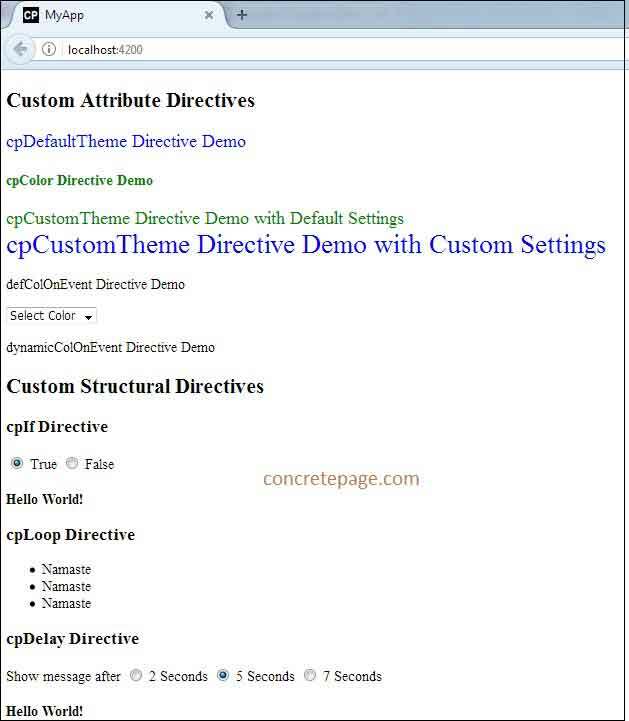 Find the steps to create custom structural directive. 2. Assign the structural directive name using selector metadata of @Directive() decorator enclosed with bracket  . 3. Create a setter method decorated with @Input(). We need to take care that the method name should be same as directive name. 4. Configure custom structural directive class in application module in the declarations metadata of @NgModule decorator. To create custom structural directive we need to use TemplateRef and ViewContainerRef etc that will help to change the DOM layout. Now let us create custom structural directives. We will create a structural directive that will add a layout in DOM for a true condition otherwise it will delete it from DOM. When showCpIf is true then Hello World! message will be shown otherwise the message will be Not Available . We will create a structural directive that will add an element in DOM layout for the given number of time. It will work as a loop. The <li> tag will be added 3 times in DOM layout. Now we will create a structural directive that will add an element in DOM layout after a given time. Once the time given by delayInSec is over, the message will be displayed.